– “-cs” and “-ms” is not modified anymore (they are the same as IceFrog’s). This is because I suspect the modification is the source of stucking bug. – Modify AI naming routines, now compatible with MM and DM. – “-aiunstuck” is modified. It was working on human player in previous AI (and was intended to overcome the stucking bug, but wasn’t working). Now it is used to unstuck AI (can only be used by server – usually blue player). As the normal unstuck, type “-aiunstuck” and wait for 60 seconds to reset all AI commands (including enemies’). The AI can move freely during the ordeal. If an AI didn’t move from its spot until the next 15 seconds (is stucked), that AI will be sent to base. – Add “-catt”, “-cai”, and “-crw”. “-cdef” is re-modified. Order all AI to defend base. Unlike the previous version, now AI WON’T stop defending until you ordered to do so (using “-catt” or “-cai”). Order AI to change lane. Enter player ID (multiple IDs is separated by [,] or [;]. “a” means all allied AIs), followed by Lane ID (1=left, 2=mid, 3=right). “-crw 3,4 1” = order player 3 and 4 to take left-lane. “-crw 5;4 3” = order player 4 and 5 to take right-lane. “-crw a 2” = order all allied player to take mid-lane. “-crw 1 2” = order all Sentinel player (you must be a Sentinel) to take mid-lane. Scourge’s ID is 7. Note that this function will be modified into the “smarter” version in the next AI. Order all AI to storm forward. AI WON’T defend until you ordered to do so (using “-cdef” or “-cai”). Gangbang the hero with appropriate “target ID”. Note that you can only put one ID as target, but can put multiple IDs on “player ID”. Note that this function will also be modified into the “smarter” version in the next AI. Also, this function will be able to gang Roshan in next version. Enable all automatic defend/def-end functions, cancelling all effects of “-cdef” and “-catt”. * Note: AI without human leader on their team will try to gang (on SuperAI) and change lane automatically, while those with leader must be ordered (with -catt and -crw). To disable the automatic function (e.g. if you’re irritated smile.gif or if the function has fatal bug I don’t know), use “-aidisablenew”. And also note that “-aidisablenew” will be removed in next version. – As before, I cannot find the cause for the stucking bug. – AI’s Aegis in DM. – Vendetta didn’t work properly. Some ultimates are still not used. – movespeed… I can guarantee 100% that I don’t use any movespeed modifying codes in my script. And I have also searched for IceFrog’s, but found none. Right now, the -ms is not modified, so it is also impossible to check for this bug. Please wait a little longer…. The best Ai i have seen so farrrr..
a good high standard training before enter the real dota worlddd…great! is 6.38 super AI by Cloud_st availaible now?? 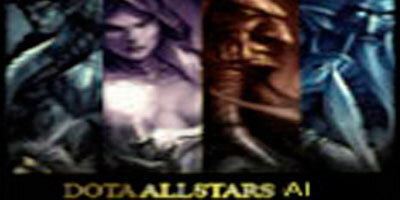 its really great and wait for it..
dota cada vez consegue se superar ! !